Telestream released Wirecast 8 Studio and Wirecast 8 Pro to the public today. Many new cool features, and some enhancements to the software switcher. We’ll look at all that Telestream has fixed, updated, and changed. Get Wirecast Here. Wirecast is a software video switching program that allows you to create broadcast quality shows using your computer. You can create scenes, overlay graphics, and switch to other scenes with the press of a button. You can also record, or stream to Facebook, YouTube, Periscope, Livestream, uStream, and many more services using the RTMP protocol. Creating new scenes has been improved with new tools that will help you resize, rotate, and even embellish your scenes. A new Z-Rotation has been added so you can flip video around. If you have camera footage that was originally upside-down (such as a GoPro), the Z-Rotation option will flip things upright for you. And you don’t have to adjust from the Shot Layer Properties. You now have on-screen tools to resize, rotate, and more. Along with new grid snapping, you will be able to take the guess out of a video’s position. Finally, the Shot Layer gets two new options – Reflection, and Drop Shadow. You can create a scene with a reflective shadow, put some depth in your text, and create a more artistic scene. If you connect a USB mixer, or have multiple audio sources, you can set up Wirecast to capture them all, and store on up to 8 different channels (in stereo). This means you can record all camera’s audio as backup for the main audio to any recording. Set up a Binaurl experience for 5.1 stereo surround, and even create tracks of commentary and translation to another language. This is perfect for sports productions, churches, and other events. Track 1 could capture in English, track 2 translated in Spanish, and still have 6 channels to record other things. When I brought guests in the past, I would connect via Skype or Google Hangouts. With Rendezvous, you don’t need those 3rd party programs. Simply send a URL to the guest, they open in a compatible web browser (Chrome, Firefox), and you can set up a scene with their video. With Wirecast Studio, you can bring in 1-2 Guests. 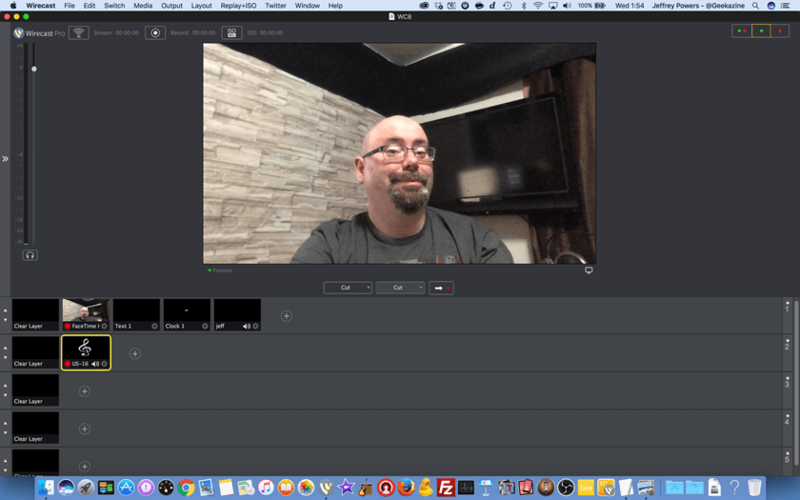 Wirecast Pro allows for up to 7 guests (if bandwidth is available). Install an add-on to allow for screen sharing. And with mobile connectivity, Wirecast Go now connects to your desktop for mobile reporting. 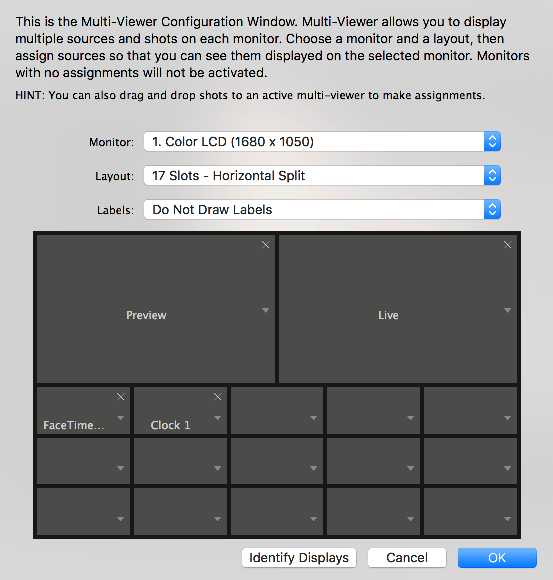 Many hardware switchers have a “Multiview Out” option, displaying all video scenes in a single monitor view. You can then queue up cameras, and put them into the live screen. Wirecast Studio allows for 4 video connection Multiview, whereas Wirecast Pro will let you set up to 17. You can even capture that monitor, which you could use as a production screen in itself! You will now be able to use .WebM files into scenes, along with importing Sony XAVC-S into your projects. A “Hot-toggle” is added to Deinterlace so you can change on the fly. You can add a Clock to your scene, with different types of date – time formatting. 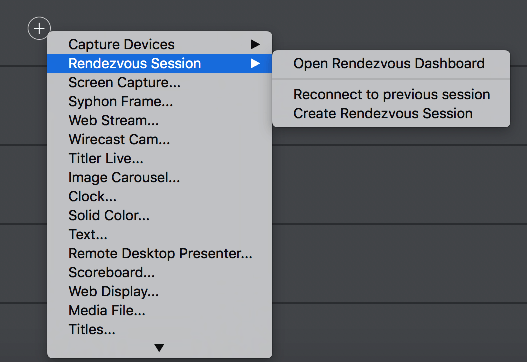 If you have software for your capture cards, Wirecast will detect, and override most device settings. That way you only have one place to make adjustments. Finally, new transitions are available in between scenes. My favorite one is RGB Channels. Check with Telestream for the full list of changes, and how NDI is incorporated in Wirecast.